Have you found an online vendor selling Koloa Dark? Vanilla overkill. Bit expensive and too sweet like all the koala rums. Nice to taste but wouldn’t buy again. All I could taste was sweet sweet sweet. Had some interesting floral notes, which was intriguing, but I just could not get past the sweetness. Would probably be okay in mixed drinks, but would absolutely not recommend with Coke. I think Koloa is one of the best American rum makers. This dark rum is my favorite of all dark rums. Smells and tastes of vanilla, chocolate, caramel, and spice. Perfect at 40%abv and quite easy drinking straight. 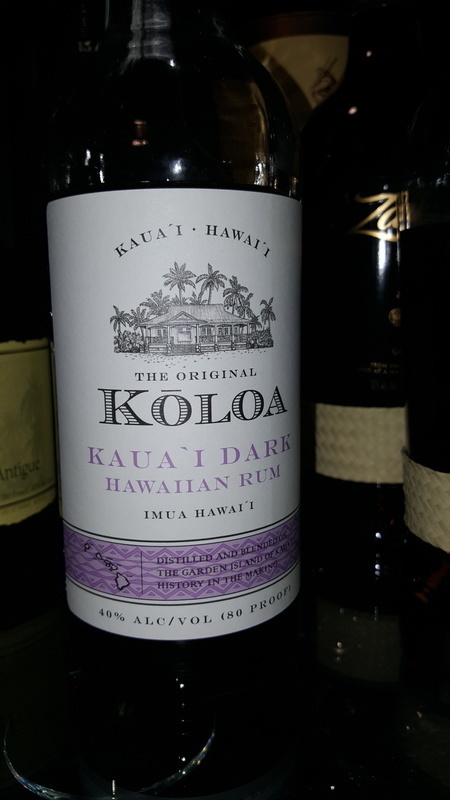 An amazing rum from Koloa! This is the best dark rum I have ever had. Don't get me wrong, I would rather have a good aged rum but if you want a dark rum then this is one. Great dark color, excellent aroma and great taste if little after burn. I certainly was not expecting the best mixing rum I've had to be from anywhere but the Caribbean. However, Koala Dark wins that prize. This vanilla flavoured rum with hints of coffee and chocolate was amazing mixed with coke, but was also surprisingly good over rocks or straight. Not quite as sophisticated a finish as more expensive rums, but still incredible. Although it makes a fabulous float, it is too good (and costly) to be used on a mai tai. Never use it as a mixer, a waste of money and great rum. By far the best rum out of Hawaii. Almost a desert liqueur, as it is somewhat sweet, but it is fabulous on the rocks at the end of your evening, being smooth, rich, and flavorful. Put me in the minority that enjoyed this on the rocks as much as I did in a mai tai. I prefer a sweeter profile, and this delivers. Nice, deep caramel and molasses on the nose that carries through the palette. It might lack the complexity of some of the finer aged rums, and the price runs on the high side outside Hawaii, but I would consider this to be a special spiced rum. A nice sweet rum with an interestingly pleasant aroma in the bottle. It has distinct molasses and vanilla flavors. Although not a sipping rum, this would be fantastic in mixed drinks calling for dark rum. Definitely recommended. Really great vanilla-coke flavor, smooth and sweet. I only sipped it neat but I think with ice it would be great. Might try it in a Remsberg’s Planters Punch...my go to test of all rums:) 3/4 oz lime juice, 1 oz simple syrup, 3 oz rum, 3 dash’s angostura bitters. swizzle w crushed ice and a few luxardo cherries w a dash of luxardo cherry syrup. A Rum Old Fashioned of sorts. I didn't know what to expect when I first tried it, but wow. Extremely sweet for a dark rum. Great for tropical mixed drinks though. Had a rum tasting on a sunny afternoon, because why not. 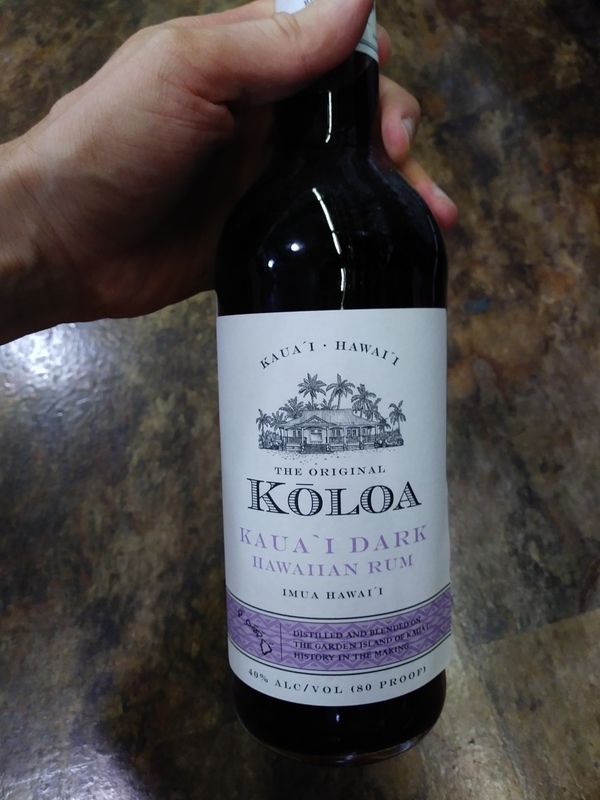 Koloa Kaua'i Dark Rum bottle and label design looks very nice and artsy. Deep brown color. There is some unmatured alcohol to the nose and palate with an explosion of sweetness and a tad of vanilla. Some burn at the end. Mix it with your favorite soda and down it goes. Not a neat sipper really. Great dark rum suprisingly not from the Caribbean. Very smooth and rich. One of my favorites. Buddy of mine got me hooked on this amazing Hawaiian Rum, find it sweet to my pallet. This stuff is like the best of EVERYTHING dark!! Aroma carries vanilla, chocolate, coffee, charred wood, licorice and root beer! The taste is not nearly as complex as the nose, but it's still pretty good: it enters with thick, vanilla custard, followed by a surprisingly pronounced cola kick. Then an odd, but somehow appropriate finish of overripe plums shows up with molasses. Drinking on it's own is fine, but this stuff makes the best gosh darn rum'n'cokes ever!! At $40 a pop, it's expensive as a mixer, but if that old standby is your thing, this is absolutely worth the money! Beautiful dark color & rich, spicy aroma. Great sipping rum! Strong with the vanilla flavor, similar to Papas Pilar. A nice mixer. On its own it was good. It was a bit sweet and less complex than your better aged rums but for the 45 buck I paid it was one I would by again for mixing drinks. Not a sipping Rum but mixed it was really solid. I was not expecting much from this Rum but it was a nice surprise. I was very surprised at how good it was for not being an aged Rum. It is sweet but very good. (12/2018) 40% ABV. Nose: strong vanilla extract with molasses and a bit of caramel. A tinge of cherry syrup. Palate: it seriously tastes like watered-down, sweetened vanilla extract. A very short finish that leaves a bitter spiciness in the throat. Not recommended, even for mixing. Might be good for baking though, or with recipes calling for vanilla liqueur. Or perhaps with cola. Shame. (11/2016) "Too sweet for my tastes" - Definitely colored (and sweetened) with too much caramel (and who knows what else). You could mix it, just adjust the sugars accordingly. Expected better. Normally, dark rums are for mixing and you wouldn't think of sipping them as most are "well rums" but this rum surprised and impressed me. I found tastes of vanilla, chocolate,coffee, and caramel are present but the coffee and chocolate are predominant. This is a smooth rum that finishes with just the right amount of heat. I would suggest this is the best dark rum for mixing out there, but I am going to serve this as a sipping rum. If you like Goslings Family Reserve rum then you will like this one. Smooth mixer, as good as any other. Nothing distinctive.